Starvation Alley is a local organic cranberry and cranberry juice producer with a mission. 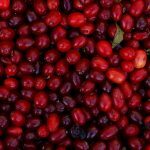 They encourage conventional cranberry farmers who want to grow organically, by purchasing their berries at a premium as the conventional farm makes the three year transition to organic. In this KBCS local food segment, company co-founder Jessica Tantisook speaks about the business side of cranberry farms and what it means to be organic. This story originally aired in 2015.